Jadeite is the first of the four generals and his goal is to obtain energy from the humans on Earth for the Dark Kingdom. Nephrite is the second general and he goes around Earth under a fake name, Sanjouin Masato, trying to gain energy like Jadeite before him. Zoicite is the third general who has Nephrite killed off. Her job is to find the seven nijizuishou, which when brought together form the ginzuishou. Zoicite is extremely vain, and petty. Her lover and teacher is Kunzite, the fourth general. Kunzite is Zoicite's lover and mentor. He works with Zoicite later on to get the seven nijizuishou. The most powerful of the four, he is also the leader of them. A type of mass rather than any substantial form, she's the leader of the entire Dark Kingdom, and she wants control of Earth. Beryl works for Metallia, but everyone else is underneath her. She wants to rule Earth, and she is in love with Prince Endymion who rejects her. Ail is the male part of the duo. He comes to the Earth with Ann, his lover, and they pretend to be students at Juuban Junior High School. His human identity is Ginga Seijuurou, brother of Ginga Natsumi. Ann is Ail's lover, coming with him to Earth for energy. She is quite nasty, and she is incredibly jealous of Ail's infatutation with Usagi, ignoring the fact that she is in love with Mamoru. Her identity on Earth is Ginga Natsumi, in the second year and in the same class as Usagi. Cooan is the youngest of the Ayakashi Sisters. Her attack is "Dark Fire," and she comes into direct conflict with Rei. Beruche is the second youngest of the sisters, and her attack is "Dark Water." She is the most "intellectual" of the four, though like her sisters, she is obsessed with how she looks. 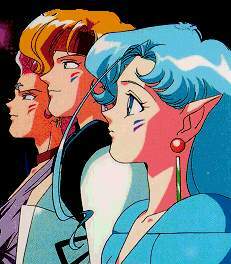 Karaberas is the second oldest, and whereas Beruche is to Ami as Cooan is to Rei, she is like Minako. Wearing a bow, she also carries a whip for her attack (similar to Venus's chain). Petz is the oldest sister, and her attack is "Dark Lightning." She is secretly in love with Safir, and she tries to help him after he is attacked by Wiseman. His job is to find Chibi-usa and the future ginzuishou, and he uses the Four Ayakashi sisters to do his dirty work for him. His main priority is to take over the Crystal Points of Tokyo. Esmeraude is the green haired woman who takes the place of Rubeus upon his death. Safir is the younger brother of Prince Demando. He is extremely dedicated to his older brother, worrying about him constantly and Wiseman's true intentions. Demando is the head of the Black Moon family. He is obsessed with Neo-Queen Serenity and her beauty, and when he sees Sailormoon, he knows that the two are the same. Black Lady is really Chibi-usa, brainwashed by Wiseman and having her memories of her family and friends twisted and warped so that she believes they hate her. Wiseman is Death Phantom, an exile from Earth. He uses the Black Moon family to try to seek revenge and destroy Earth. Chibi-usa as Princess Serenity and Usagi as Neo-Queen Serenity destroy him using the two ginzuishou in episode 88. Tomoe is the leader of the Death Busters, and his mission is to bring Pharoah 90 into the world. Tomoe was originally good, but in an explosion in his lab, his daughter, Hotaru, was killed. An entity appeared, saying that in exchange for him being possessed, it would let Hotaru live. She's Tomoe's lab assistant, and she has long red hair (that she can use as a weapon) and kind of dead looking skin. The first of the Witches 5, she is the successor of Kaolinite. Eudial has red hair in three pony tails, red eyes, and a red and black outfit. Eudial uses her computer to track down possessors of heart crystals. The most annoying of the Witches 5, Mimete is childish, immature, and irresponsible. She has short, curly, yellow hair and orange eyes. The Witch to follow Mimete, Tellu's love is plants. She poses as a brilliant student, Bidou Yui, in Mugen Gakuen and makes friendly advances towards Ami. Then Viluy arrives and reveals herself to be a Death Buster. Cyprine is the most powerful of the Witches 5, and her twin sister is equally strong. Cyprine has blue hair and carries a staff with a star, as does Ptilol though she has red hair. The Messiah of Silence, Mistress 9 is the entity that possesses Tomoe Hotaru; Hotaru periodically has seizures where Mistress 9 controls her for short periods of time. The head leader of the Death Busters. Tigerseye is the one with the orange hair in the center of the picture. He carries a whip around as a weapon. The guy with the flame like hair and the dress with the sash, the one on the far left. His victims are always older women. Fisheye is the one in between the arguments generally, and she is the only one who is actually happy when pictures of men show up in the stack. ParaPara is the insane one of the Quartet. Although the others sometimes dismiss her as a little girl, she can freak them out at times. JunJun is the acrobatic one of the group. Sort of like VesVes, she's impetuous and pretty tough. VesVes can be considered a leader. Pretty impetuous, she was the one who decided to go against Zirconia's authority and battle her. CereCere's favorite thing is flowers. While she appears to be the most quiet and nicest on the surface, she's really not. She can be devious when she wants to, and she's actually pretty snobby. A weird female that works for Neherenia. She gives orders to the Amazon Trio and the Amazoness Quartet. The beautiful leader of the Dead Moon, she turns to evil when she realizes she can never stay young and beautiful forever. Long ago, she and her powers were sealed into a mirror by Queen Serenity. Kisenian flower is a flower that can't do anything on its own. It takes control of a weak willed individual and makes that person do what it wants. Fiore is an alien who knew Darien/Mamoru when he was in the hospital after his parents died. He was being controled by the Kisenian flower and told to destroy the earth because everyone left Mamoru alone for all of his life. Princess Snow Kaguya wanted to freeze all of earth to add it to her collection She had tried once before but failed to do so because she was hit be a great light. Queen Vadilanne is obsessed with opening the Black Dream Hole. She needs children's dreams to make the Dream Hole grow large. Puplan, Bananu and Oranjiya were told to collect children for Queen Vadilanne so that they could sleep and dream in eternal happiness. Sailor Galaxia is a Sailor Senshi that came from another solar system far away. Her main goal is to rule the universe and to do this she has to fist capture each solar system in it. Sailor Iron Mouse was the first to work under Sailor Galaxia. Her job was to find the star seed that Sailor Galaxia wanted so much. Sailor Aluminum Siren was the next Sailor Animate after Sailor Iron Mouse. Once she tried to take Sailor Moon's Star seed, but was stopped by Chibi-Chibi. She died when Galaxia took her Sailor Crystal. Sailor Lead Crow was the total rival of Sailor Aluminum Siren. Everytime Sailor Aluminum went to earth she would follow. She was devastated when Aluminum Siren was killed. Sailor Tin Cat was the last of the Animates. She was vindictive, power-hungry and conniving. She appeared just before Siren's Death. She pointed out Siren's failures to Galaxia. Lead Crow had to work with Tin Cat and they did not work well together.